It all started with 9/11 when Osama Bin Laden was successful beyond his wildest dreams. Not only did three out of the four hijacked planes hit their targets and kill 3,000 people in the most dramatic terrorist strike in history, but more importantly he threw this country into such a state of terror that its population willingly “gave up essential freedom to purchase a little temporary safety” and allowed themselves to be turned into vassals of a police state. The President and Congress acted swiftly: First, to create the Department of Homeland Security, a national police force with virtually unlimited powers, and second, to more or less clandestinely expand the mission of the National Security Agency to include, for the first time since its charter sixty years earlier, monitoring of the electronic communications of American citizens at home and abroad. Be still, o foolish hearts in the Gestapo, the Stasi, and the KGB. Since then, both have continued to expand their roles, as has been tirelessly documented by bloggers like myself, the indefatigable Some Assembly Required, and most recently, The Intercept, not to mention even fairly often now by the national media, so i’ll add nothing now. My objective today is to call to mind some trickle down from the national policing organizations to our state and local law enforcement authorities, all of which have been escalating both in acquisition of armaments like tanks and assault weapons traditionally reserved for the national military forces and also in the level of violence against civilians. I do not pretend that the American populace is given over to nonviolence nor that it is unarmed, and i certainly recognize that our police need to be armed to protect themselves, but what we’re seeing more and more nowadays is outrageous police violence against unarmed civilians. Worse yet, much of this violence is directed against women and children who cannot possibly present a threat to the police. We’ve all seen news accounts, a recent egregious one being that LA case in which an unarmed, mentally disturbed great-grandmother walking along a freeway margin was thrown to the ground and repeatedly punched in the face by a policeman. Or the case in Santa Rosa (north of San Francisco) in which the local district attorney has declined to file charges against a sheriff’s deputy who last fall plugged seven rounds into a 5’2″, 13-year-old schoolboy who was carrying a BB gun the cop thought was an assault rifle. The distance from the deputy to the boy was 67 feet, and the last few bullets struck the boy as he was lying on the ground. Well, you gotta make sure. Especially interesting about this latter case is that the deputy had a history of overreaction that has been extensively detailed but which is summarized here. Late update: Turns out that the only independent expert hired by the Santa Rosa DA to investigate the shooting makes a living exonerating police in such cases. What have we come to? I’m just wondering if the Santa Rosa DA might possibly have filed charges against the deputy if he’d gunned down a 13 year old girl. OK, a ten year old girl? Naw, doesn’t matter. They’re all dangerous. 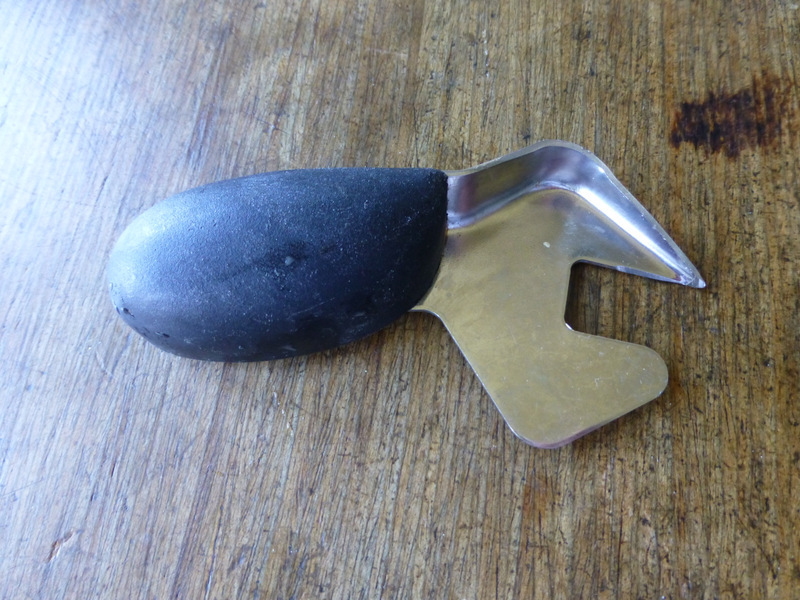 Speaking of weaponry, here’s a patent oyster shucker Gloria gave me. Better not carry it outta the house, as it might look dangerous enough to get me shot.